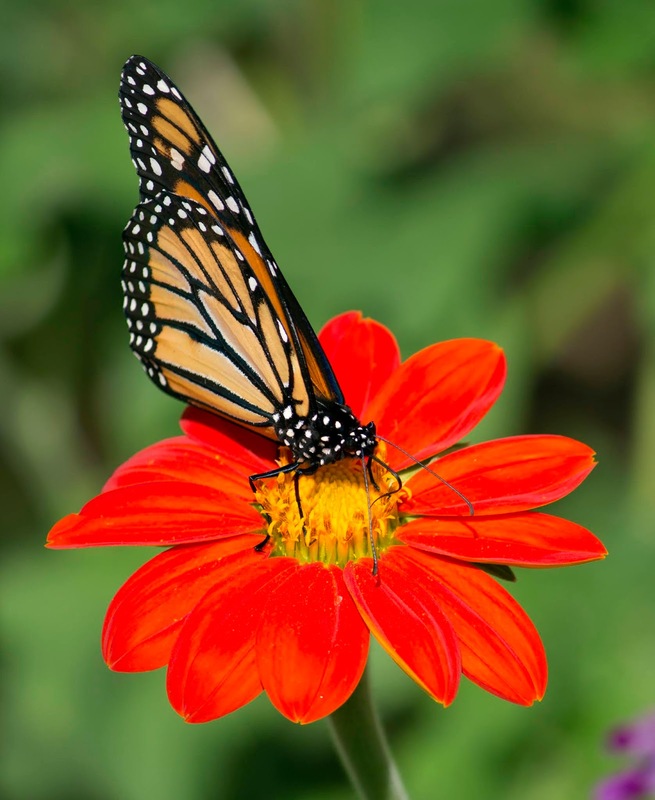 You are invited to join us on 3/14 at the Bartram Trail Library for a presentation by Master Gardener, Dianne Battle, on supporting local butterflies and other pollinators. The meeting starts at 10AM. Master Gardeners can receive CEU credit for attending. Refreshments will be served, and we appreciate you letting us know if you'll attend so we'll have enough snacks for all. In the meantime, a reminder that Daylight Saving Time takes effect on Sunday, March 10. Set your clocks ahead by 1 hour on Saturday night. And St. Johns River Water Management District's Daylight Saving Time water schedule goes into effect. Read about it at their website SJRWMD Watering Restrictions page. If your irrigation timer still challenges you, here is an article on how to set and maintain it, when to run it and when you can turn it off without adversely affecting your lawn. Overwatering not only can create problems for your lawn, but it costs you more money. Save the green in your wallet and in your yard! 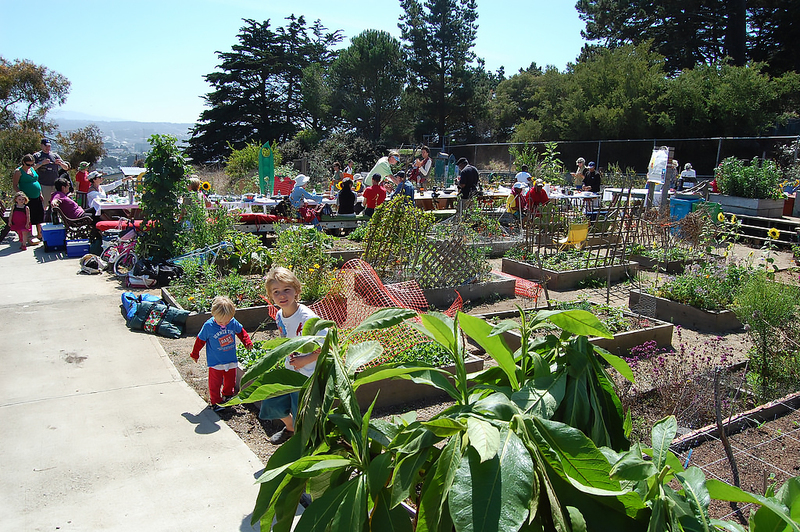 See the Helping the Planet Stay Healthy in our Resources section for more timely information. Master Gardener, Karen Matulina, gave us a wonderful presentation on community gardens and brought some special gifts: vegetables, flowers and herbs she had grown. Click here to see the names of the items. Her presentation summary will be in the March edition of The Creekline. Karen's garden is part of the UF/IFAS Extension Center community garden; plots are available for rent by contacting the Extension Center. 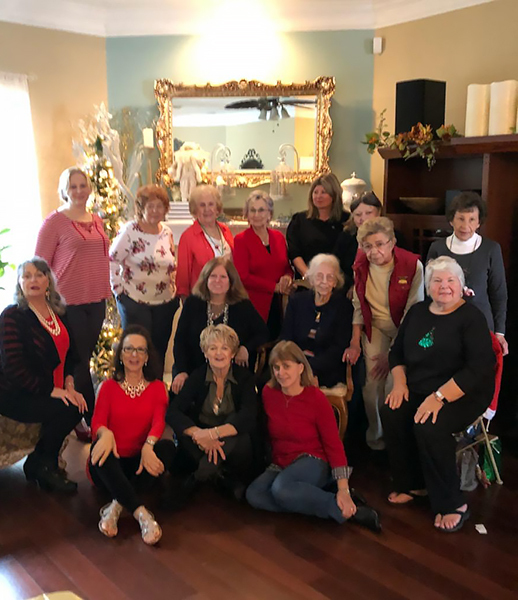 See their Winter 2018 Newsletter for contact info and gardening tips. And see our Resources section, "Fresh Vegetables - Spelled Y-U-M" for recipes our members used for the vegetable they selected courtesy of Karen Matulina. We also had a discussion on how to reduce waste by increasing our use of recycling. Some of the suggestions were amplified by our UF/IFAS Sea Grant Agent, Maia Mcguire, Ph.D. in page 3 of her 2019 first quarter Aqua Notes newsletter. Our February 14 meeting features Master Gardener Karen Van Pernis, who will discuss plant propagation. If you'd like to join us, please contact us via this website so we have enough food and drink for you. 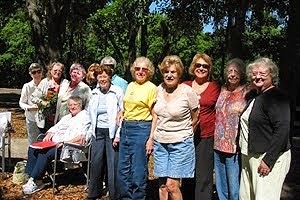 We meet in the Bartram Trail Library, 60 Davis Pond Blvd, at 10AM. Please feel free to be our guest on the 24th. Do contact us so we know to provide enough refreshments. Master Gardeners may be eligible to claim CEU credit. Our February meeting will be at the regularly-scheduled date and time, 2/14, featuring Master Gardener Karen Van Pernis on Plant Propagation. See our Events page for details and other presentation. In case you missed it on Sunday (or want to know more about it), the decade's last lunar eclipse was visible in our area. See our post in the Resources section, "A Phenomenon Called the Super Blood Wolf Moon Eclipse." The Garden Club of Switzerland celebrated 2018 with a holiday party at Deborah's beautifully appointed house. As our hostess she had arranged for a catered meal courtesy of Bono's and served by Steve. Before diving into our meal Deborah offered a blessing for the food, the friendship, and for the love we all felt for each other. After delicious deserts our members brought, we had a gift exchange, which is always so much fun! After the wrapping paper was torn open, we were reminded that Christmas paper, like any paper, is recyclable. Nancy told us about a company called "Sensible Recycling" on Sunbeam Road that recycles computers, phones, and does certified data destruction on hard drives. The company is veteran-owned and operated. And their services are FREE (including free pickup within a certain area). They take everything apart and recycle usable parts; nothing goes to a landfill. At last month's meeting we were given a handout from the University of Florida's Extension, Florida Sea Grant titled, "Five Things You May Not Know About Plastic Recycling." Don't just Reduce, Reuse, Recycle, but Rethink, Refuse, and Repair! A great New Year's Resolution! A personal aside, I showed up an hour early because I didn't check my notes. They didn't make me leave or even work. What a great bunch of folks! I had enough time to bond with the dog and cat and tour the backyard where Deborah performs "Elopement weddings." as she calls them. Deborah was more than gracious in opening her home to us. Please note that our January meeting date has changed to January 24. Other meeting dates are as noted on our Events and Calendar page. Click our photo to find out About Us. New for 2015 - We're on Facebook too! You can email, read our posts, or visit. You might even decide to join the club. All are welcome! Click here for easy ways to keep up with us! The State Wildflower License Plate Gets a New Look. Show your love of Florida Wildflowers by purchasing a Florida State Wildflower license plate. The purchase raises money for wildflowers, wildlife and wild places. You can purchase a plate at your local DMV office or request one online with this link: Order Wildflower License Plate Online. More information on the purchase process and prices is at State Wildflower License Plate Information. Lowes has announced a phase-out of neonicotinoid pesticides and pesticide treated plants in its Corporate Shared Responsibility Report (4/9/2015). If you'd like to see neonicotinoids phased out completely, go to the Friends of the Earth Petition to the EPA to ban neonicotinoids and add your voice to the call. Show your support for providing the monarch butterfly protection as an endangered species. Sign the Credo petition to the US Fish and Wildlife Service to do just that. Environmental tip: Save resources by shopping for local produce. See our Resources posting, Local Farms Come to You for more info. Show your love of Florida Wildflowers by purchasing a Florida State Wildflower license plate. The purchase raises money for wildflowers, wildlife and wild places. You can purchase a plate at your local DMV office or request one online with this link: Order Wildflower License Plate Online. More information on the purchase process and prices is at State Wildflower License Plate Gets a new look. YES ON ONE - WE DID IT!!! The Water and Land Legacy Amendment One was passed by an historic percentage of Florida voters! While amendments to the state Constitution require 60% of the voters to approve, the Water and Land Legacy Amendment was passed by 75% of voters. Learn what this will mean to us as Florida residents. And see the Yes on One website to learn more. Consider making a contribution to help us continue our beautification efforts. Find out about us and what you can do to allow us to continue. See our Forms and Brochures in the Resources page. You are invited to share our memories of our dear long-time member, Carolyn C. Kellihan who passed away in June 2015. Please read the memories and tributes to Donna Keathley, vice-president and dear member of our garden club. We all note their passing with great sadness. ABC News filed a report on whether bottled water has any advantages over tap water in areas where water sanitation practices are in effect. See our Resources post to learn how to help a school of your choice get educational resources. LET'S STAY IN TOUCH: 1-EMAIL, 2-FRIEND US, 3-DROP BY, 4-SUBSCRIBE, or 5-JOIN! 2 - FRIEND us on Facebook. 3 - DROP BY! We meet once a month from September through May. See our meeting info as well as our public events at the Garden Club of Switzerland's calendar. Who is Reading our Posts? 5 - BECOME A MEMBER! Joining the club is the ULTIMATE way of staying in touch! Read our membership brochure to learn about the benefits. Then complete the application. 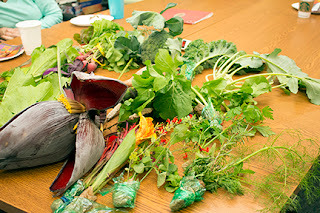 This is a free DIY Blog from The Garden Club of Switzerland . We used:. Picture Window theme. Powered by Blogger.